Notes on Mac, iPad, and iPhone using folders with iCloud. Is there a better alternative to CocoaNotes? Is CocoaNotes really the best app in Productivity category? Will CocoaNotes work good on macOS 10.13.4? 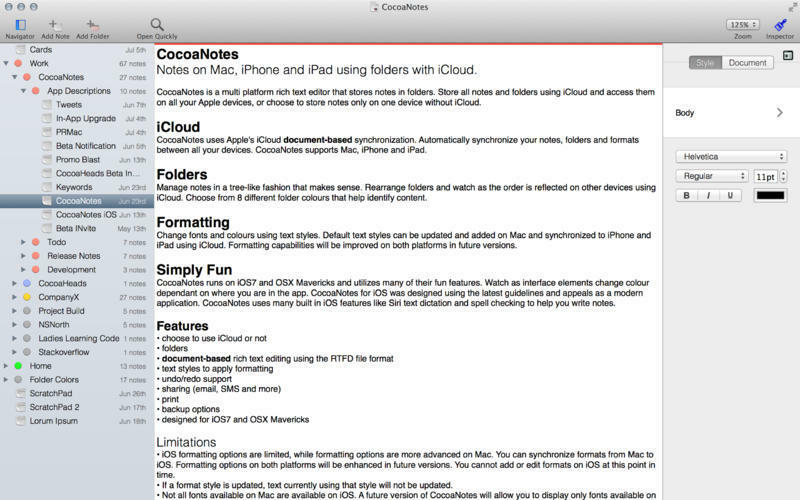 CocoaNotes is a multi-platform, rich-text editor that stores notes in folders. Store all notes and folders using iCloud and access them on all your Apple devices, or choose to store notes only on one device without iCloud. Synchronize your notes, folders and formats between all your devices. CocoaNotes uses Apple's iCloud document based synchronization, a huge advantage when compared to existing iCloud enabled text entry apps available today. Manage notes in a tree like fashion that makes sense to you. Rearrange folders and watch as the order is reflected on other devices using iCloud. Choose from 8 different folder colours that help you identify the folders content. Text styles also known as formats, can be applied to text. Formats added on OS X are synchronized to all your iCloud devices including iPhone and iPad. CocoaNotes is also available for iPhone and iPad. You'll find it on the App Store.